The US bears a considerable share of the blame for driving the situation in Ukraine towards the poor state it is in now, the speaker of the Russian State Duma says. The crisis threatens entire European continent. Instead of promoting a peaceful resolution for the crisis, Washington and its allies are bent on imposing sanctions against Russia, “partially to cover up their own guilt for the events,” Sergey Naryshkin told a media conference in New Delhi. “The guilt of the United States of America for those events is considerable and obvious to the entire world,” he stressed. Meanwhile Russian Foreign Minister Sergey Lavrov said the travails of Ukraine are a direct result of Western interventionism. “For a quarter of century the key principles of the United Nations had been systematically violated. The US and other Western nations neglected the fundamental rules of international law, widely used double standards and didn't hesitate to intervene directly into other nations' sovereign affairs. The impact of this policy is fully felt by the peoples of Yugoslavia, Iraq, Libya and now Ukraine,” Lavrov said at a diplomatic scholars’ meeting in Moscow. 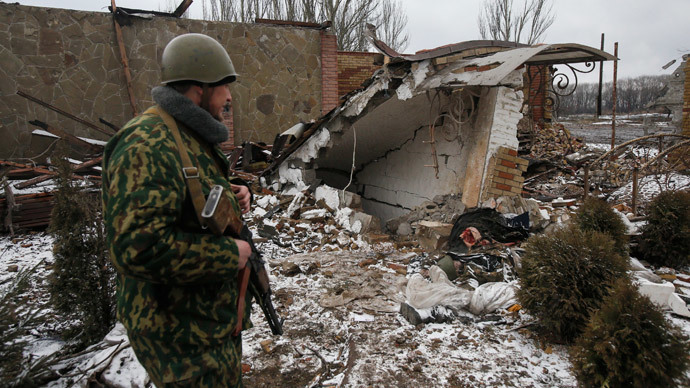 Apart from sanctions Russia sees a more direct threat to the fragile ceasefire in Ukraine. The UK announced it would send military trainers to help Kiev build up its army. Officials in Moscow see the move as potentially derailing the truce. “Britain, which was not part of the Normandy format [Germany, France, Russia and Ukraine, which negotiated the ceasefire], is apparently prepared to derail the entire process. What kind of EU unity over a political resolution in Ukraine are we talking about here?” a source close to the Kremlin told journalists on Friday. “Statements from London that say there’s no military solution to the Ukrainian crisis amid this move appear to be at least hypocritical and a case of gambling with the security of all Europe in worst-case scenario,” the source added. The ceasefire brokered by the four nations in the Belarusian capital, Minsk, appears to be holding up despite numerous violations. The level of violence reported in eastern Ukraine has considerably decreased, and both Kiev and the rebel forces are pulling back heavy weapons from the front line under OSCE observation. However little trust remains between the combatants, and both warn that they would turn their weapons back and resume hostilities if attacked. On Friday, Kiev reported that three of its troops had been killed over the previous 24 hours, after two previous days with no combat losses. On Friday, Russia sent its 16-truck humanitarian aid convoy to the war-torn regions in eastern Ukraine. Rebel military engineers are using the calm period to search for unexploded shells and other remnants of the battles and dispose of them, RT correspondent Marad Gazdiev reports from the scene.